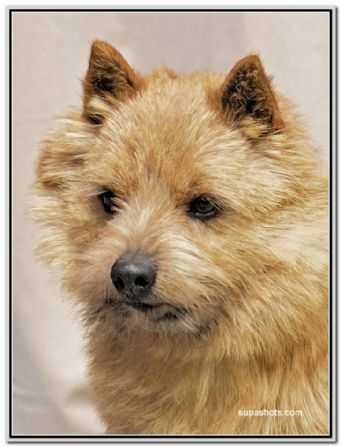 A very typey young dog with the happy, outgoing temperament of his breed, Leo is gaining more and more show success as he matures. He had a wonderful day on the 22nd October, at the first day of the Waimakariri Kennel Association's 2011 Championship Show. John Sullivan of Melbourne gave him his first Group win. BIS judge, Bob Cleland of South Australia, awarded him Puppy in Show against some lovely puppy entries. 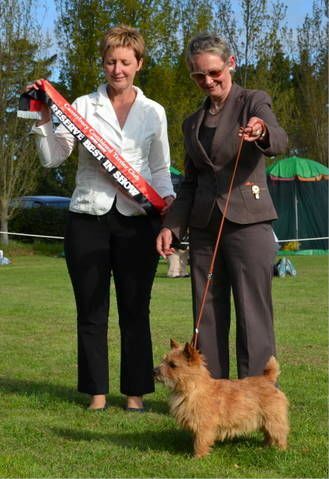 The day was made perfect when South Canterbury judge Robynne Trainor gave Leo Reserve in Show and Puppy in Show at the Canterbury Combined Terrier Club's Open Show, held in conjunction with the W.K.A. Show. 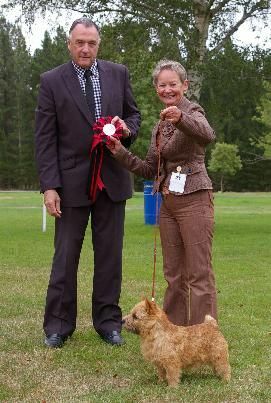 At the Canterbury Combined Terrier Show on the 13th of November, judge Anthony Price from Melbourne, Leo was Best of Breed in a strong entry of 12 Norwich Terriers. Mrs Leah Ryan, NSW, placed Leo third in 42 entries for the Pauleen Prue Memorial Puppy Stakes, Waimate Kennel Society, 26th November, 2011. In his first show weekend after turning a year old, Leo won Junior in Group at the Banks Peninsula A&P Society Show at Leeston, under judge Mrs S. Walker. The Canterbury Kennel Association Waitangi weekend double banger Open Shows saw Leo winning Best in Show at both Shows, under judges Tony Kesseler and Gerard Price. What a thrill! Leo won Best in Group at the Canterbury Ladies Autumn show on the 3rd March 2012, under Mrs Megan Markotany, NSW. He added two Reserve in Groups to his record at the Nelson Ladies KA Show in April (Mrs Maribel Sy, Philippines judging) and the South Otago show in May (Judge Kim Tosi) and another two Junior in Groups under Kay McKei and Sharron Taylor at these shows respectively. Leo was judged Supreme Personality Puppy at the annual Supreme show awards in Christchurch in June. A special day for Leo and his proud breeder was the Waimakariri KA show on 21st October, when WA judge Mr Bob Beatie judged him Reserve in Group, and Junior in Show. Leo has the Gold Certificate of Merit for 50 Challenges.